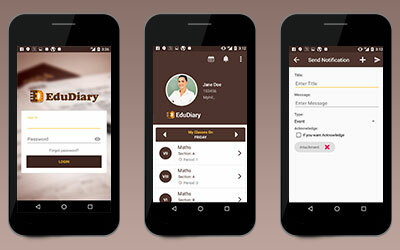 EduDiary transforms the school diary into a modern, effective and engaging version. For long, schools have used paper diaries, SMS, emails, websites and other mediums for communication. It’s time to bid adieu to them all and replace it with the revolutionary EduDiary. Designed to facilitate parent-teacher communication, the mobile app offers a consolidated platform to interact, view updates, track daily work and stay updated with relevant information. EduDiary makes it possible to share daily homework, allow teachers to streamline their daily work, showcase timetables, send alerts on upcoming events, announce holidays, reminders, ask for parent opinion and more. With EduDiary, schools can go eco-friendly, save on print and bulk SMS costs and promote timely sharing of information. It enables interactive communication, showcases the commitment of the school in contributing towards students’ holistic development and increases parent involvement in their ward’s academic progress. Parents receive an authorized login that will instantly lead them to the dashboard, containing basic student into, timetable and daily assignment updates. In addition, they can receive notifications/survey forms directly from the school with important messages on school trips, holidays and more. Staff can login and view their daily work timetable. The single-tap update feature allows them to allocate home work to an entire class at one shot, and also on a per student basis. The dashboard features a notification center where staff announcements/ alerts can be sent by higher-level authorities. Ditch the primitive ways and embrace the technological revolution with EduDiary! Register your school with us and take the first step towards transformation.